custom lengths made to order and bulk up to 1000'.Installing high quality Solid Copper RG 6 coaxial cable cannot be emphasized enough. Copper clad center wire...steel wire coated with copper. Sold by most retailers. Copper clad is an inferior wire and do not offer this item. RG-6 Coax, U.L. Listed, Solid Copper, Black. This coax cable is easy to work with, especially in cold weather. $0.34 Ft. Sold to your specified footage without coax cable ends attached. Also available for order in custom lengths w/connectors at our on line store. Custom made from 2.5' to 250' lengths. High quality, low signal loss, indoor-outdoor, flexible, with solid copper core, lifetime warranty, made in the USA. Model CE-01 Price $0.40 ea. RG 6 Crimp On Coaxial Cable End F-Type Cable ConnectorThis Silicone injected coax connector ensures a complete water resistant seal for outdoor use. These crimp-type coax connectors are a great choice for an inexpensive connection with RG-6 cable. The gel and O-ring make them great for use outdoors. Having the right tool can make all the difference in the world! Model LSC-10 Price $0.50 ea. These PATENTED coaxial cable connectors are designed to provide a professional, secure, waterproof connection for coaxial cable. Reduces signal leakage and protects against water migration. Use with Compression Tool below. Compact Compression Tool for RG 6, RG 6 quad and RG 59 coax cable is pocket-sized and easy to use! Stop using tools that weren't made for the job! This little tool will strip your RG-6 coax cable perfectly every time. 1 qty. 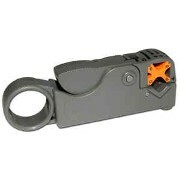 Heavy duty coax cable crimp tool. Crimps both RG 59 or RG 6 coax cable sizes. 1 qty. Coax cable cutters. These cutters are sharp and will properly cut coax cable without crushing the cable. 1 qty. One step wire stripper. This tool strips and prepares the cable for proper connector installation in one step. 10 qty. Watertight silicone filled crimp fitting connectors for RG 6 coax cable size. 1 qty. 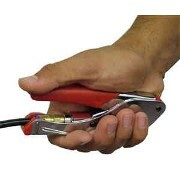 Heavy duty coax cable compression tool tool. Crimps both RG 59 or RG 6 coax cable sizes. 10 qty. 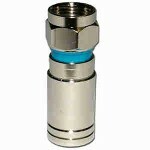 Watertight compression fitting connectors for RG 6 coax cable size. HOLDS COAX CABLE TIGHTER AND LONGER THAN NAIL CLIPS. PERMANENTLY WATERPROOFS COAX CABLE CONNECTIONS. FITTING, FOR A WEATHER TIGHT CONNECTION. Have a question about coax cable and accessories?? ?